A few days back, I was telling my husband that I have been reading too much on food and nutrition related material and that I needed a break. As though the universe heard my plea, I got an email with the synopsis of this book on the same day. Though the plot sounded like a cliched love story, I opted for the book review, mainly because it was written by a female author and I love reading a woman’s perspectives on relationships. Though the storyline is so predictable, what makes this book interesting is the beautiful and flowing narrative. I loved the characterisation of Rishi, the male protagonist - a perfect, sensitive and down-to-earth boy with respect for his roots and family values. He respects his parents so much that he doesn’t mind agreeing to an arranged marriage at an early age. On the other hand, Dimple is the girl who loves coding, nurtures a dream to build an app and happily wears a t-shirt with the line “Silly boys, coding is for girls”. I could relate so much to Dimple - ambitious, living life on her own terms without caring about what society expects of a girl and clear about what she wants in her life. At many places, I was nodding my head when Dimple faces various dilemmas in life - choosing Rishi v/s focusing on her career, attending a party with bullies v/s giving it a miss, making an effort to look nice v/s just staying in her loose tees and comfy pants etc. And my most favourite part was the emphasis on “kismet” that brought them together. It felt so heart-warming to read how they cared for each other’s life passions and offered full support. 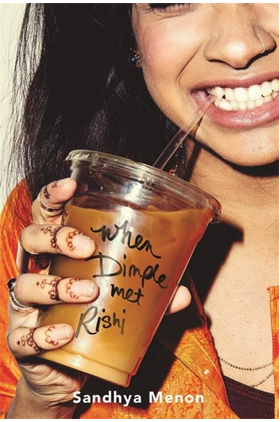 There are also a couple of good subplots that revolve around friendship between Dimple and Celia, the conflicts between Rishi and his brother Ashish. “I’ve made him defensive by constantly judging his choices because they aren’t the ones I’d make"
While I read this line, I had to pause for a minute and think about the number of times I got defensive and later felt bad about it. This line brought some much-needed peace. If romance/rom-coms/simple love stories are the kind of genre you'd like to read, then I’d highly recommend this book. Perfect read for a cool, rainy afternoon.